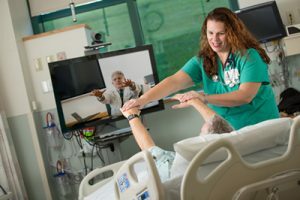 From emergency department care, to remote patient monitoring for chronic care management and access to care from specialists, telehealth is changing the way healthcare is provided — both expanding patient access to routine and specialty care, while improving patient satisfaction and outcomes. In many cases, telehealth saves lives by delivering specialty care in rural areas where there may not be access to specialty healthcare providers. The following are just a few examples of how North Carolina’s hospitals and health systems are using telehealth to keep people happy, healthy and living their best lives. 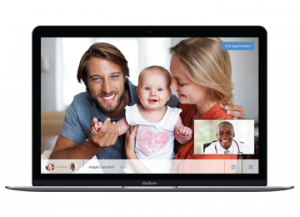 Telehealth services are as good as those provided in traditional in-person consultations. 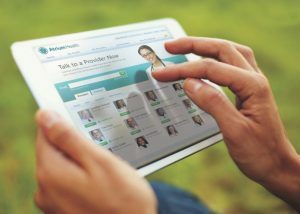 In some specialties, particularly in mental health and ICU care, telehealth delivers a superior product, with greater outcomes and patient satisfaction. A robot named “Corey” is Lenoir Memorial’s link to Wake Forest Baptist Medical Center’s Telestroke Network, an Internet-based system that gives 20 community hospitals across North Carolina access to 24-hour, real-time, two-way visual and audio communication with acute-stroke experts at Wake Forest Baptist’s main campus in Winston-Salem. Recently, when a senior citizen presented with slurred speech and weakness to the UNC Lenoir Health Care Emergency Department, tele-stroke services were activated less than 10 minutes after arrival. The stroke neurologist “beamed in” on Corey and recommended the administration of a strong clot-busting medication and immediate transfer to a comprehensive center for a possible thrombectomy. The patient was given the medication and transferred to Vidant Medical Center, where he would undergo a procedure to remove the clot causing the stroke. The procedure was successful, as a 4.5 cm clot was removed from the blood vessel in the brain and circulation was restored. Even though it does not have a neurologist on-staff 24/7, contracting tele-neurology services allows Cone Health’s rural Rockingham County hospital to provide neurology and stroke services to patients in their community without having to transfer them to larger hospitals outside of the community. Off-site tele-neurology physicians work closely with emergency department personnel and attending physicians to offer their expertise to stroke patients saving precious time, which translates to saving lives, decreasing long-term disability, and improving the care patients. Without these services, this small rural hospital would not be able to provide the specialized care needed to become a Joint Commission certified Acute Stroke-Ready Hospital. Telehealth services not only provide a more positive patient experience, but they also provide a profound community health function, cutting down on the number of unnecessary exposures to illness. Mission Health has used its Mission Virtual Clinic to head-off a pertussis outbreak this past November, treating three active cases of pertussis using its telehealth services, instead of having patients wait in their cars for a doctor to see them in the parking lot. Mission Health’s Virtual Clinic was especially valuable during North Carolina’s 2017-2018 flu epidemic, keeping patients out of the ED where they could spread or acquire highly contagious illnesses. Using an adaptive online process to determine what signs and symptoms patients had, and prescribing medications that are sent directly to their pharmacy of choice, patients were treated at home, usually within 30 minutes to an hour. Mission Health’s Virtual Clinic was especially valuable during North Carolina’s 2017-2018 flu epidemic, keeping patients out of the ED where they could spread or acquire highly contagious illnesses. Using an adaptive online process to determine what signs and symptoms patients had, and prescribing medications that are sent directly to their pharmacy of choice, patients were treated at home, usually within 30 minutes to an hour. Using telehealth technologies not only reduces travel time, but it also reduces the related emotional and financial stresses for patients and their families. Such services offer patients access to providers that might not be available otherwise without the need to travel long distances. Vidant Health and Eastern Carolina University are among only 18 academic medical centers nationwide participating in the Association of American Medical Colleges’ Project CORE, which aims to improve the patient referral process between primary and specialty care using electronic eConsult and enhanced referral templates. ECU has reported that eConsults and enhanced referrals are saving their patients time and money, helping them feel better, sooner. Instead of waiting weeks or months, primary care doctors are able to get their patients answers in a matter of hours, with current referral times averaging 22 hours, well below the AAMC standard of 72 hours. Telehealth has been shown to reduce the cost of healthcare and increase efficiency through better management of chronic diseases, shared health professional staffing, and fewer or shorter hospital stays. It also encourages better utilization of healthcare services. Atrium Health’s Virtual Clinic was launched in 2017 to improve access to pediatricians while children are at school. 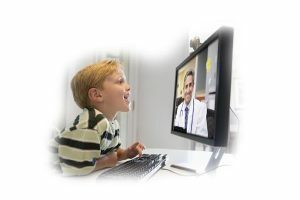 Using audio and video technology, students are evaluated by a pediatrician located remotely at Levine Children’s Shelby Children’s Clinic, and parents are invited to join in-person or via audio or video. “The virtual clinic provides families the opportunity to seek medical care for their school-aged children more readily,” Patricia Grinton, MD, director of Levine Children’s Shelby Children’s Virtual Clinic, said in a news release emailed to Becker’s Hospital Review. 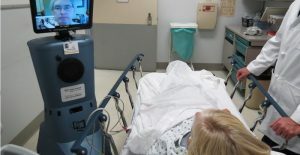 “The students are evaluated for healthcare needs while they remain at school and their parents continue their daily activities, such as work.” Since rolling out the telemedicine program, the virtual clinic has reduced unnecessary emergency department visits by 55.6 percent for those students seen via virtual appointment. Cone Health’s E-Visit program has seen an all-time high in users since launching two years ago. Having 10-20 virtual office visits per day, the e-visits have taken the pressure off the hospital’s ED and provides more time for patients with critical needs.